The Middle Eastern answer to casual fast food, falafel dominates street food culture in countries such as Israel, Egypt and Syria. A mash of chickpeas and spices, falafel balls generally get deep fried and then served inside the pockets of soft pita bread with diced vegetables such as tomatoes, cucumbers and red onions. The sandwiches are then topped with a tahini dressing or sometimes a yogurt sauce or hummus. It can be a little tricky to make your own falafel but certainly not difficult. With just a bit of practice, you'll be making them like a pro in no time. The convenience of packaged falafel mixes is that you only have to shape and fry the fritters. But it's worth trying to make your own. The trouble you might encounter, the first time around, is getting the right consistency so that your falafel won't break apart as you drop it into the oil. A binding ingredient can help keep it together, especially if you are using canned beans instead of dried. And the perfect binding ingredient for falafel is flour. Nothing fancy, just plain all-purpose flour. Add a few tablespoons at a time to your mixture, until you can press it easily into balls or patties. Just be sure you don't overwork the falafel batter. Handle it as little as possible and use a scoop to form the balls and drop them into the oil. Specialty shops actually sell a falafel former but a cookie scoop will work just fine. Otherwise, you might end up with hard, dense nuggets instead of a crispy, airy bite. Resting the prepared falafel balls in the refrigerator for about an hour before you fry them can also help them keep their shape when they hit the hot oil. For best results, the oil should be between 350 and 360 F. Work in batches so that you don't crowd the pan when you fry the falafel as that can cause them to bump into each other and knock them apart. It also lowers the temperature of the oil, which can prevent the protective "crust" from forming and make the balls soggy. Fry a few at a time, making sure the temperature remains in the desired range. Use a slotted spoon to gently turn them so they brown evenly on all sides. When they look golden, remove them from the oil and set them on paper towels to drain. Not only are they easy and inexpensive, but they usually taste good. 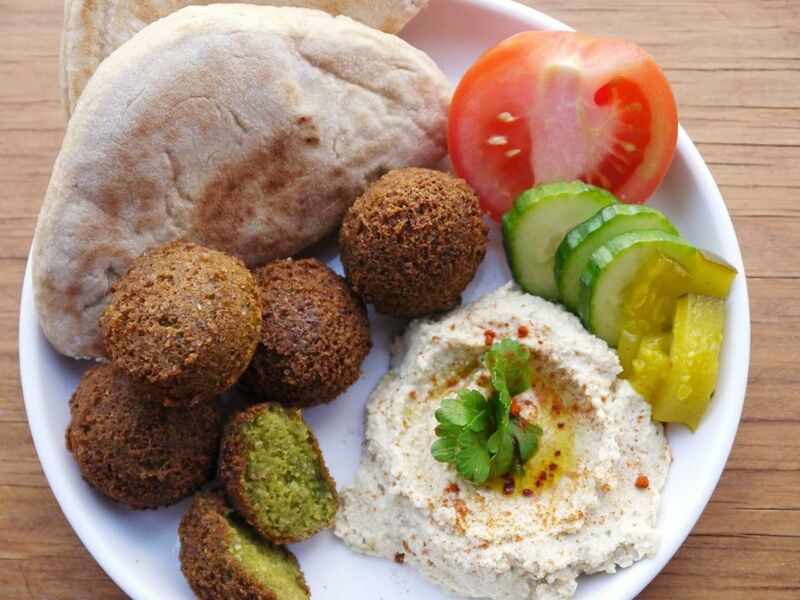 Perhaps not quite the same as homemade but definitely worth trying and a great way to quickly satisfy your falafel craving without heading out to your favorite Middle Eastern eating spot. Serve falafel for lunch, dinner or as a snack, either as a sandwich in a pita or on a salad. One, or two-bite, falafel balls make an interesting appetizer paired with hummus or other dips. You can also use falafel as a vegetarian meat substitute for a burger.